Event at Philadelphia’s National Constitution Center pairs art and discussion of the document. The speakers during the debate: Ola Mestad, Jeffrey Rosen, and Kaare Strøm. This article originally appeared in the Oct. 31, 2014, issue of the Norwegian American Weekly. Philadelphia is known as the birthplace of America. The Declaration of Independence was written and approved here in 1776, and the Constitution followed in 1787. Philadelphia houses the National Constitution Center. What many people don’t realize is the U.S. Constitution birthed the Norwegian Constitution at Eidsvoll 27 years later. On October 22, in a joint venture of the Norwegian American Chamber of Commerce-Philadelphia, the National Constitution Center, Norwegian Consul General in New York and Global Philadelphia, the 200th Anniversary of Norway’s Constitution was celebrated at the NCC. An exhibit featured paintings related to Norway’s Constitution by contemporary Norwegian artists Christopher Robert Glein, Sverre Bjertnæs, Bjørn Båsen and Inghild Karlsen. Their work and those of six other artists, and articles by 15 authors appears in a book, Red, White, and Blue: Norwegian Constitution, American Inspiration. It was published by Trond B. Olsen’s Art Pro Forlag AS in Drammen. A polite discussion took place between two authors of articles in the book, Kaare Strøm, professor of political science at the University of California, San Diego, and Ola Mestad, professor of law at the University of Oslo. 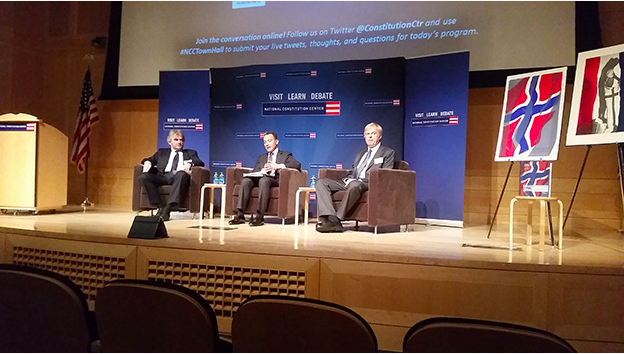 Jeffrey Rosen, Executive Director and CEO of the National Constitution Center, served as moderator. Among the questions Rosen posed were what Americans inspired the Norwegians; the early power of farmers; the role of the King; the unequal aspects in both countries’ original Constitutions, and how each document evolved as times changed. He often quoted from exact articles in the Norwegian Constitution. “The Norwegians had two American heroes who inspired them, George Washington and Benjamin Franklin,” said Mestad. Women were granted the right to vote in 1913, seven years before the United States. “There were some arguments for women’s suffrage at the Constitutional Assembly, but it was never discussed,” said Mestad. One of the fascinating developments is how the role of the King evolved. In 1905, Norwegian men elected Danish Prince Carl as King. He became Haakon VII without any power. Copyright © 2019 GRUNNLOVSBOKEN - GRUNNLOVSBOKEN | 1814–2014.